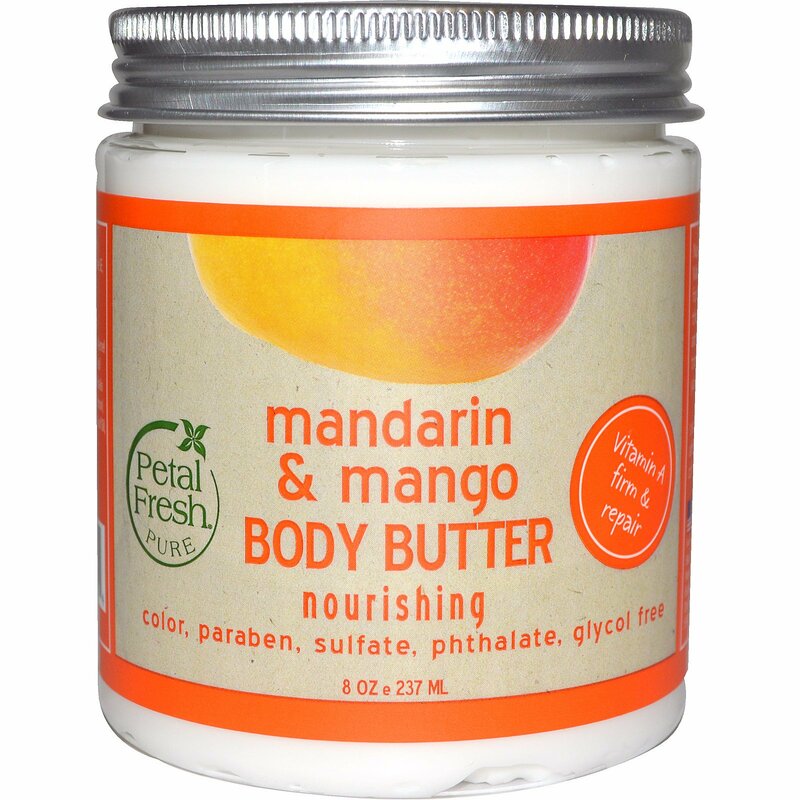 Nourish and moisturize your skin with Petal Fresh Pure Mandarin & Mango Body Butter. This ultra-rich formula is fortified with essential oils and good-for-you ingredients that drench the skin with moisture. 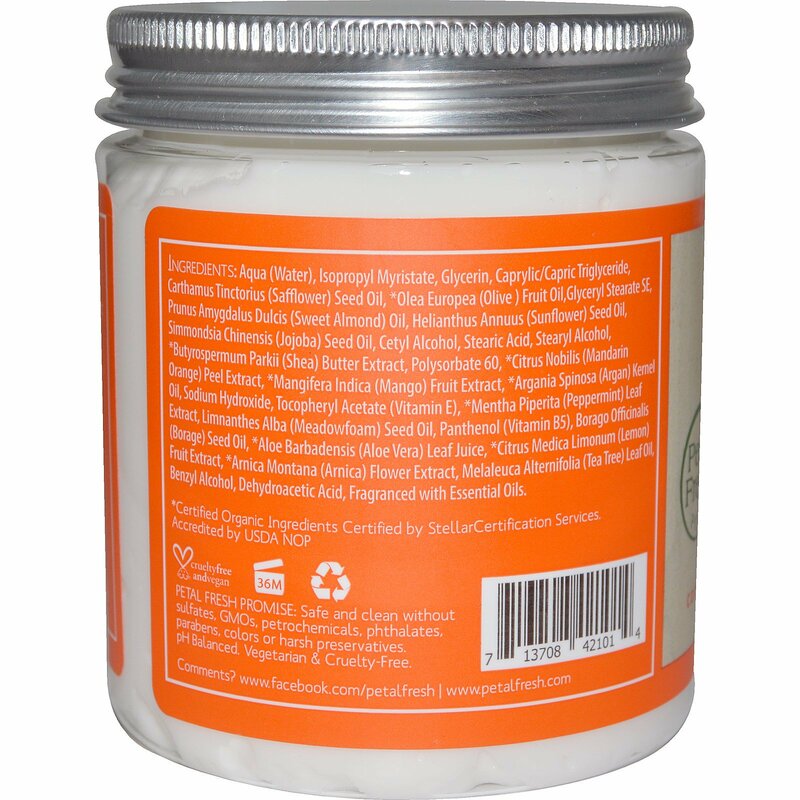 Not only will the exotic aroma of Mandarin & Mango take your mind away to a tropical paradise, the creamy, luxurious texture will leave you reaching for more! Apply liberally to clean, towel-dried skin after showering, bathing or whenever skin needs a boost of moisture. Aqua (water), isopropyl myristate, glycerin, caprylic/capric triglyceride, carthamus tinctorius (safflower) seed oil, *olea europaea (olive) fruit oil, glyceryl stearate SE, prunus amygdalus dulcis (sweet almond) oil, helianthus annuus (sunflower) seed oil, simmondsia chinensis (jojoba) seed oil, cetyl alcohol, stearic acid, stearyl alcohol, *butyrospermum parkii (shea) butter extract, polysorbate 60, *citrus nobilis (mandarin orange) peel extract, *mangifera indica (mango) fruit extract, *argania spinosa (argan) kernel oil, sodium hydroxide, tocopheryl acetate (vitamin E), *mentha piperita (peppermint) leaf extract, limnanthes alba (meadowfoam) seed oil, panthenol (vitamin B5), borago officinalis (borage) seed oil, *aloe barbadensis (aloe vera) leaf juice, *citrus medica limonum (lemon) fruit extract, *arnica montana (arnica) flower extract, melaleuca alternifolia (tea tree) leaf oil, benzyl alcohol, dehydroacetic acid, fragranced with essential oils.